Cover crops can be an elusive subject for someone who hasn’t grown them before. When folks usually think of having a vegetable garden, they often consider only the vegetable plants. However, those plants need to be fed and if they are grown in the same space year after year with nothing added for nutrition, the productivity of your garden and the health of your soil will decline. Bringing inputs from somewhere else to feed your garden brings up the sustainability concern of the depletion of the resources at somewhere else. If your compost depends on the manure and bedding from your neighbor’s horse, then you have to consider where the feed and bedding materials for that horse came from and how the earth is compensated for that. If amendments were brought in to fertilize the grain/straw/hay used by the horse, it broadens, even further, the footprint that is required to feed your garden, and ultimately you. It is good to have your soil tested and add minerals and anything else that may be necessary, using organic amendments. You will also need to add organic matter. Continuous additions of organic matter are needed for all gardens, especially if you have sandy soil or clay soil. Organic matter serves as a slow-release fertilizer that helps build soil structure and is home to microbes, keeping your soil alive. To build organic matter in your soil, think cover crops. You could address your organic matter needs by bringing in mulch in the form of leaves or straw or buying compost, but then you would have to contend with the ever-widening footprint of your garden. Besides that, there is the possibility of Killer Compost, which I wrote about here. Even if you were okay with that, you have to acquire those things, then haul them around. However, you can grow all your mulch and compost materials right in your garden! When you do that you have the added benefit of the organic matter and soil life that results from the roots of those crops. It is hard to explain just how much those roots that are left in the soil add to your garden. You may have to see it and touch it to believe it, but it is amazing! Picture the crop above ground; then picture that much biomass as roots that are added to your organic matter reservoir. A wonderful bonus is that you don’t have to haul it there. Crimson clover at full flower. You don’t need a tiller to manage cover crops. In fact, to get the most benefit from these crops, using a tiller would be a disadvantage. I propose to let the cover crops grow to maturity, or almost to maturity (flowering stage) and cut them with a sickle. You can let them lie where they are as mulch for the next crop or use the biomass as material for your compost pile. It is possible to plan enough cover/compost crops to make all the compost you need. More on that here. To manage these crops without a tiller you need to plan carefully. It is not quite so important with the legumes, such as peas, beans, and clovers. They can easily be pulled out or cut with a sickle and put in your compost pile. Unless you need the area sooner, wait until the plants are in full flower before you cut them. The grain crops, such as rye and wheat, are different. Their root systems are so extensive that, if you cut the plants at full flower (you wll see they are shedding pollen), the plants won’t regrow, but you will still have a lot of roots to deal with. Wait two weeks for the roots to begin to decompose before you transplant into that bed. If you want to plant seeds after a cover crop, rather than transplants, use a legume as the preceding cover crop or wait until the grain crop has fully matured to cut it. At that point you will have seeds and straw. The plants will have completed their life cycle and the roots are ready to expire into the soil. Without removing the stubble, you can use a hoe to make furrows and plant seeds. Rye cut in early May. Rest of the rye and wheat will grow out for seed to be harvested in June. Cereal rye, also known as winter rye, gives me more biomass than wheat. I like to use it before crops, such as corn, tomatoes, and squash that I want to mulch. I’ll cut it and let it lie right there in the bed. This mulch will eventually break down, feeding the soil, but by then I will have a crop that is spreading over it to cover the soil. Sweet potatoes do this nicely beneath my corn. Legumes have less carbon, causing them to decompose much faster than straw from the grain. You could cut it and let it lie as a mulch, but you better have a plan to add more mulch soon, or you will be left with bare soil and Mother Nature will plant her weeds there. Compost on the right is ready to use. Pile on the left will be ready to spread by fall. I plan for at least 60% of my garden for the year to be in cover/compost crops so that I have enough biomass for the compost that I need. It is not all rye and clover. 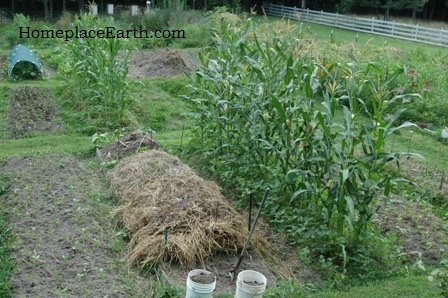 Some of the compost material is corn stalks, which provide much needed carbon in my compost pile. I designate a bed for my compost piles for the year, rotating it to the next bed in October. The goodness that has leached out of the compost all year is taken up by the cover crop, usually rye, which is planted in the former compost bed. The rye soaks up the goodness left by the compost and gives it back to the corn crop the next year when I cut the rye at pollen shed and leave it in place as mulch for the corn. Rye cut at flowering (pollen shed) in early May stays in place as mulch. Rye cut when the seeds are mature in mid-June goes to the compost pile as straw. The seeds are saved for eating or planting in the fall. The bulk of your cover crops will be planted in the fall, but I am writing this now so you put them in the plan you are making for this year’s garden. Make a garden map and fill in each bed with everything that will grow there for the entire year—all 12 months. Add appropriate cover crops that will be out in time for the next desired crops to go in. So much to tell and so little space……. You will find more information throughout my blog and in my DVDs and my book Grow a Sustainable Diet. Once you have some experience with cover crops, you will realize that it is the easy way to go. Beware of bringing outside inputs into your garden! I began to hear about problems with persistent herbicides in compost that were causing crop damages when gardeners applied it to their gardens in 2001. It used to be that good organic gardeners gleaned compost materials from everywhere they could. They took in leaves and grass clippings from their neighbors and gladly hauled stable bedding from wherever they could find it. Even if these materials had been produced by conventional methods, rather than organic ones, it was thought that whatever residual chemicals might be left would break down in the composting process. Not anymore. There is a 21st century problem of herbicides that can survive the composting process and still be active enough to cause herbicide damage on your vegetables. These herbicides target broadleaf plants and are used to produce weed-free lawns and weed-free hay and grain. If you used grass clippings or hay and straw from treated areas as mulch, you could find yourself with herbicide damage to your garden. Furthermore, if an animal ate the hay from a treated field and the manure was composted, that compost would still contain the active herbicide. The first chemical I heard about was clopyralid, marketed by Dow AgroSciences. By 2004, the label had been changed to try to keep the clippings from treated turf out of the compost stream. Until 2007 I was reading about places far from my home. Then the September 2007 issue of Growing for Market published the article Contaminated hay ruins crops. The folks at Waterpenny Farm in Sperryville, VA had experienced herbicide damage on their tomatoes and squash as a result of applying hay as mulch. They had bought second quality hay, as usual, from a farmer they’d been dealing with for five years. Unfortunately, that farmer had begun using an herbicide containing picloram on the fields he cut. The herbicide salesman did the application and the farmer never saw the label, which stated not to use the hay from a treated field as mulch. At that time, September 2007, we were deep into working on our video Cover Crops and Compost Crops IN Your Garden. I had long since stopped using outside sources for compost and mulch materials as I concentrated on GROW BIOINTENSIVE methods. If I did not already have that knowledge of how to use cover crops, I would have felt completely helpless. I was very sad to learn what happened at Waterpenny, knowing it would also be happening to countless others. On the other hand, our new video would show people how to raise their own compost and mulch materials as part of building their soil fertility. I was happy to be able to offer a solution. For some updated research for this post, I headed to the library at the Western Campus of J. Sargeant Reynolds Community College where I used to teach. That library has the best selection of sustainable ag books I have ever seen. It also has BioCycle magazine. Sure enough, the June 2011 issue of BioCycle had the article Dupont Label Says “Do Not Compost” Grass Clippings by Dan Sullivan. It seems that this problem is never-ending. DuPont now has the herbicide aminocyclopyrachlor which has been marketed as Imprelis to the landscape industry–people who need a pesticide license to apply it. However, Scotts is going to be adding it to a product for homeowners– people who don’t have a pesticide applicator license. Watch for it in some of the Scotts Miracle-Gro weed control products in a garden center or big box store near you! Aminocyclopyrachlor will replace 2,4-D and atrazine in these products. Just two weeks ago, Barbara Pleasant wrote about aminocyclopyrachlor for Mother Earth News at http://www.motherearthnews.com/grow-it/imprelis-killer-compost-zb0z11zrog.aspx, including problems of Imprelis with trees and shrubs. These companies know of the damage that can occur when these chemicals persist through composting and end up in your garden. 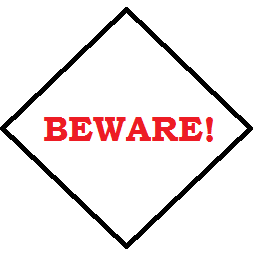 They feel they are doing their part to keep them out of your gardens by including on the label instructions to not use what is taken off the fields or landscapes in compost or as mulch. In the real world, however, these things DO end up as compost or mulch. To protect yourself you would have to be able to go to the farmer and ask what has been applied to the field and search the label yourself. The feed store that you get your hay and straw from may have run out of their local supply and brought some in from far away. The place you got that truckload of compost from may have many input sources. Good luck! If you already have a problem with contaminated soil, learn all you can. You will have to play a waiting game for a few years for the herbicide to no longer be effective, but you can grow grass there. Barbara Pleasant reports a way to test for these chemicals by soaking the materials and using the water on pots of beans at http://www.motherearthnews.com/ask-our-experts/simple-compost-test.aspx. For more information on this issue, google “killer compost”. You could forget about those other sources and only use what you grow yourself. Besides, bringing materials from outside your boundaries depletes the soil where they are grown. What is going to feed back that area? We have to look at the whole picture–the complete cycle. My video Cover Crops and Compost Crops IN Your Garden takes you from March through November in my garden and shows you how to manage those crops using only hand tools. My video Develop a Sustainable Vegetable Garden Plan shows you how to plan those crops into your rotation. Choosing the right crops and planting and harvesting them at the right time takes some practice. 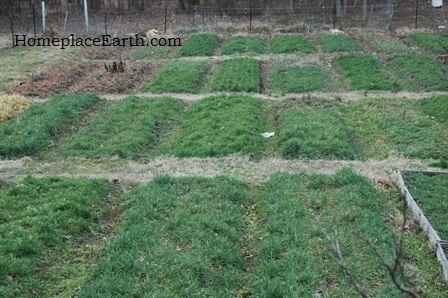 My blog will give you help along the way with posts such as Cutting a Rye Cover Crop at Pollen Shed and Grains in Your Garden. It appears there will be persistent herbicides with us for quite awhile. Rather than try to learn the chemical names and the products they are used in, it is best to avoid any herbicide use altogether. Think of your property as one living organism. Whatever is done to one bit of it affects the rest. Learn to manage your soil fertility with cover crops and you and your garden will be much healthier. Happy cover cropping!